MS804 crashed on the African Plate border just north of Egypt. Precisely on the border, in fact. Because electro-magnetic pulse, caused by the yet to be admitted Nibiru, is not to be admitted, the establishment cast around for an excuse. The options have been to demonize the pilots, as in the case of the GermanWings flying into the Alps in 2015, where the pilot was claimed to be suicidal, murderously so. The pilots of MH370 were also blamed, and still are to this day, for running off with the plane in 2014, stealing it. Their homes were ransacked looking for evidence of their nefarious plans. AF447 in 2009 was ascribed to bad weather and an incompetent pilot who did not know how to operate in a storm. The fact that all the electronics shut down, as documented by the ACARS system, was ignored. Lately, the excuse de jure is to blame terrorism, so the immediate pronounced assumption for the downing of MS804 was a terrorist bomb. Yet surprisingly, there was hesitation! The Airbus A320 left the French capital's Charles De Gaulle Airport at 9.09pm GMT last night before coming down off the Greek island of Karpathos ten miles into Egyptian airspace at around 00.30am. Officials said there was no distress call. A captain on board a merchant ship in the Mediterranean reported seeing a 'flame in the sky'. Greek air traffic controllers said they spoke to the pilot while over Greece and did not report any problems. The plane then disappeared 10 miles into Egyptian airspace while travelling at 37,000ft. The airline said the aircraft was 'fading' when air traffic control lost contact with the plane. Initial reports suggested the plane had not sent out a mayday call. Egyptian Prime Minister Sherif Ismail said on Thursday that it was too early to rule out any explanation for the disaster. The country’s aviation minister said a terrorist attack was more likely than a technical failure. Officials from a number of U.S. agencies told Reuters that a U.S. review of satellite imagery so far had not produced any signs of an explosion. They said the United States had not ruled out any possible causes for the crash, including mechanical failure, terrorism or a deliberate act by the pilot or crew. The airplane swerved, while going down, first 90 deg to the left, then a full 360 deg swerve to the right. This is odd behavior after a bomb blast, which tends to end the life of the flight immediately. The plane goes down in pieces, wrenched apart by the bomb and then torn into pieces by the air speed. Still, this was argued by those wanting a simple terrorist explanation. Perhaps it was only parts of the plane seen swerving, after having been blown into pieces by the bomb. Yet if only parts were being seen by radar, what happened to the body of the plane and the other parts? And why would parts swerve? Greek radars detected that the aircraft had taken a normal course through Greece’s airspace and did not deviate. The radars then spotted sharp turns in the aircraft’s trajectory as it plunged from a cruising altitude to 15,000ft, then disappearing from radars. At some point before dropping off radar, the plane swerved 90 degrees to the left and then made a 360-degree turn to the right before plunging first to 15,000 feet, then 10,000 feet. Swerving was likely pieces of the aircraft being picked up on radar as they fell from the sky, U.S. officials told CNN. Then more evidence for or against the bomb theory emerged. Diligent aviation watchers noted the ACARS system reporting incidents in the minutes before MS804 went missing from radar. Smoke detectors and other sensors not related to fire or smoke complained, for a full 3 minutes before communication with the plane stopped, and then another 7 minutes passed before the plane disappeared from radar. This also is not the signature of a bomb, but the terrorist bomb protagonists did not give up. Aviation experts explained that these types of signals can indicate “electrical problems”, but the media was pushing a fire from an “incendiary device”. The cause of the crash that killed all 66 on board remains unclear but smoke alarms were sounding for almost three minutes before it began its rapid descent. The leaked data was filed through the Aircraft Communications Addressing and Reporting System (ACARS), a data link for sending messages between planes and ground facilities. 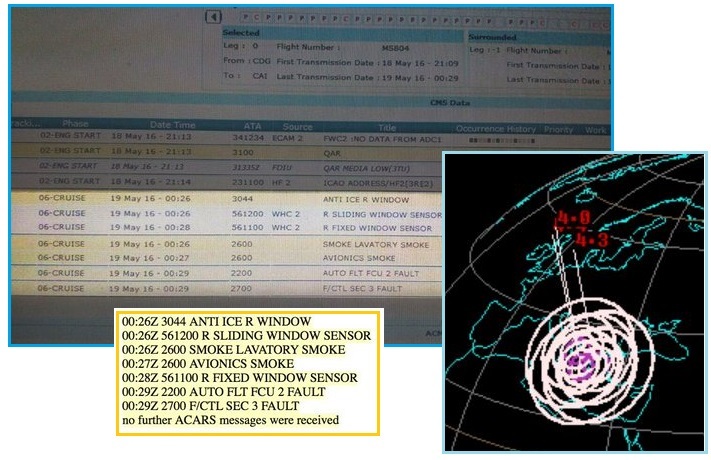 An ACARS screen grab published by air industry website. According to the leaked data, smoke alarms in the lavatory behind the cockpit first began sounding at 00.26GMT. Less than a minute later, smoke was also detected in the avionics. The final two alerts from the plane indicate faults with the FCU - the flight control unit used by the pilot to input instructions into the flight computer - and the SEC 3 - the computer that controls the plane's spoilers and elevator computers. Experts have warned the messages of smoke on board are unverified and may be a result of “electrical problems” rather than definitive evidence of what happened. US military experts have denied knowledge that any explosion has been detected. Are we going to admit the truth about these EMP downed flights? Admit that flying is no longer safe as before, since Nibiru has arrived in the inner solar system? Impact the airline industry’s profits, from all those eager travelers clamoring for flights to vacation resorts, or visiting relatives on a dime? Per the Zetas, despite some honest admissions, the fault will land on a terrorist bomb, as any other excuse is unacceptable. Corporate profits rule! ZetaTalk Explanation 5/21/2016: What is known is that MS804 was being flown by experienced pilots, in clear weather, and had not reported any mechanical problems nor issued any distress signals. The plane went down suddenly, with a shipping vessel reportedly seeing a flaming object in the skies at that location, and swerved to the left, then to the right as it disappeared from radar. 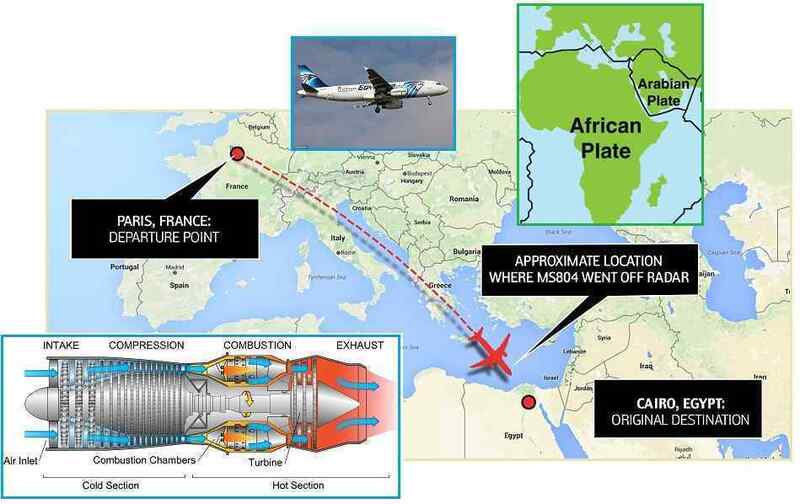 Though the location is on the African Plate border, in fact precisely on the plate border, all indications are that a bomb took the plane out. How else to explain the lack of a distress signal and the reports of a flaming object? An Electro-Magnetic Pulse can take everything out, interfering with all electrical activity in its path. The radio equipment, the jet engines, the ability of the pilots to maneuver the aircraft – all are stopped dead. Explosions happen when the jet engines have fuel aflame that cannot vent, as the jet blades are stopped. Explosions in first this and then that side of the plane will cause the swerve observed on radar. This will, of course, be blamed on a bomb, as the airline industry will not allow discussion of EMP to dampen their profits. How will using the perpetual excuse that downed airliners are caused by terrorism, a bomb, or pilot insanity affecting the travel industry? The travel industry, which includes corporations that make the airplanes, fly them, or provide resorts or hotel accommodations, are caught in a catch-22. If they admit EMP is a factor, they lose business. If they continue to deny, blaming terrorism, then the TSA delays will get increasingly draconian. The head of the Transportation Security Administration warned travelers to expect long airport security lines to continue during the peak summer travel season despite Congress' shifting of $34 million to the agency. Congress agreed to shift forward the $34 million in TSA funding to let the agency pay overtime to existing staff and hire an extra 768 screeners by June 15. 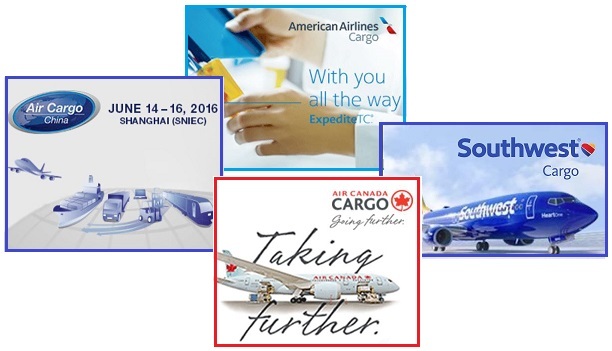 The agency is funneling many of those resources to major hub airports like Chicago's O'Hare International. More resources were needed to address a shortage of screeners. The government cannot take shortcuts that could endanger security. Several of the busiest airports have threatened to replace the TSA with private passenger screening companies. There's been a 15 percent increase in passenger volume and a 10 percent drop in staffing since fiscal year 2013. The union representing TSA officers called on Congress to pass emergency legislation funding the hiring of an additional 6,000 full-time screeners. Congress has starved TSA of the resources it needs to meet growing demands at our nation's airports. ZetaTalk Comment 5/28/2016: Where lack of funding for adequate TSA staff is being accused of causing the long lines at airports, there is of course more to this picture. TSA has been a fact of life for those wanting to travel by air for years, and this is the first time a crisis of this proportion, on airports across the US, has emerged. What is not being revealed are the directives from Homeland Security, which have steadily included more and more tasks that the TSA must perform. They are responsible for more than padding down passengers, for instance responsible for cargo and baggage coming into the US and inspecting parts and repairs on the airplanes themselves. Meanwhile, the specter of terrorism looms ever larger, with ISIS bombing attacks in Europe and Indonesia and Syrian immigrants who cannot be vetted as their homelands are a rubble being recent examples. Terrorists wanting to make a statement may aim to assassinate a Head of State or bomb a nuclear power plant, but these routes are difficult. Far easier is to explode an airplane in the skies. This gets in the news, and the terrorist can claim responsibility even when this is not the case. Airline companies, ever seeking to increase or maintain their profits, advertise travel for vacations, and the American public has come to consider this a birthright. Thus we have the inevitable clash, where travel for pleasure or business, for vacation or to visit family, or to take advantage of price breaks the travel industry desperate for profits is offering to incite more and more of the public to pack up and head to the airports. We have stressed that airplane travel will get increasingly risky, due to EMP which is already taking planes down in dramatic fashion. If the clash between airline and travel industry profits and the TSA is making the news today, the price of tickets due to the cost of insurance will be next. How many downed planes will it take before the public realizes that casual travel is no longer feasible? Stay home, learn to garden, and corporate profits be damned! Indeed, a quick check via search engine shows that the TSA has many, many responsibilities, only some of which are to be known by the public. And the list keeps growing! Civil aviation remains a target of terrorist activity worldwide. Terrorists continue to seek opportunities to destroy public confidence in the safety and security of travel, deny the ability of the public to move and travel freely, and damage international economic security. The Electronic Baggage Screening Program was established by congressional mandate for screening of all passenger checked baggage for concealed explosives. The program achieves this mission by managing the full life cycle of acquisition activities including requirements identification, testing, procurement, deployment and sustainment of screening equipment. TSA distributes funds to airports to assist in infrastructure improvements to enhance the ability of airports to: install baggage conveyer systems related to aviation security; reconfigure terminal baggage areas as required to install explosive detection systems; deploy explosive detection systems behind the ticket counter, in the baggage sorting area or in line with the baggage handling system. The large airliners that have gone down due to EMP during the past few years are the sturdy fly-by-wire models. These planes are comfortable and reliable, allowing electronics to help the pilot in all their decisions. These planes are also entirely at the mercy of electronics, as nothing the pilot does can bypass the electronics, which are intrinsic to every maneuver. 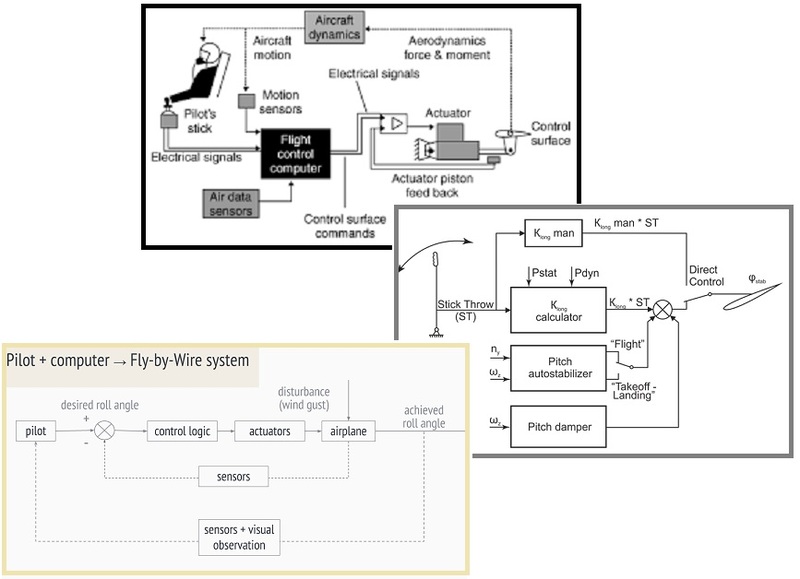 The fly-by-wire means that in the aircraft, the (pilot or autopilot) control inputs are fed to the (flight) computer, which processes them and determines the required control surface movements and transmits this by electrical signals (through wires, hence the term fly-by-wire) to the appropriate actuators. This is in contrast with the mechanical system, where the pilot control inputs are directly transmitted to the flight control actuators, through push-pull rods or cables. Aircraft with fly-by-wire flight controls require computer controlled flight control modes that are capable of determining the operational mode (computational law) of the aircraft. Two aircraft manufacturers produce commercial passenger aircraft with primary flight computers that can perform under different flight control modes (or laws). The most well-known are the normal, alternate, direct and mechanical laws of the Airbus A320-A380. Boeing's fly-by-wire system is used in the Boeing 777, Boeing 787 Dreamliner and Boeing 747-8. 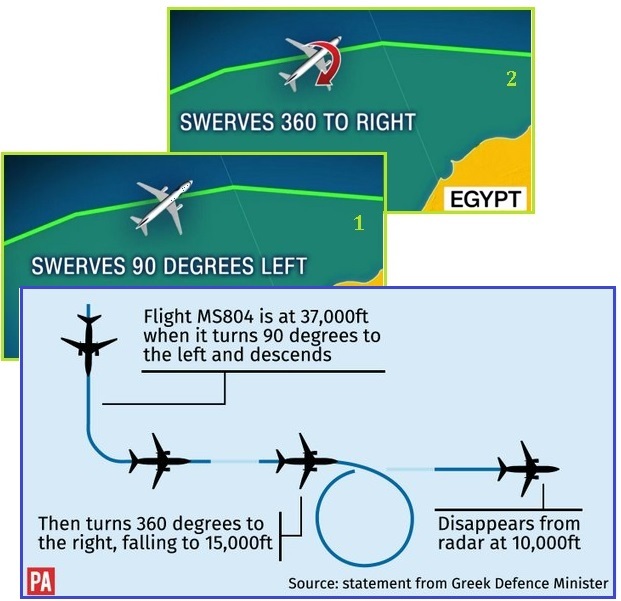 Note that the recent MS804, which had obvious electronic problems causing the plane to spiral and swerve, is an A320 fly-by-wire plane. 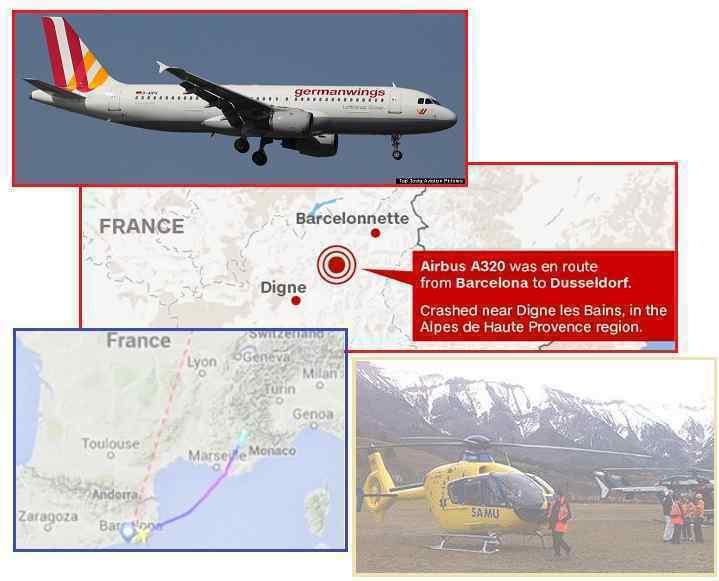 The Germanwings plane, which flew into the Alps in 2015 at a time when Cern was having problems and many European cities were dealing with unexplained blackouts, was an A320. The MH370 lost in 2014 was a Boeing 777, also on the list of planes which fly-by-wire, and the Russian plane that went down over the Sinai in 2015 was an A321, also a fly-by-wire. The Airbus A321-200 took off from the Egyptian seaside resort of Sharm El-Sheikh at 5:51am local time (3:51 UTC), in the direction of St.Petersburg. Some 22 minutes later, air control, according to local officials, lost contact with the jet, which by then had climbed to 9,450 meters (31,000 feet ). Flight tracking websites then reported a rapid, almost vertical, descent. 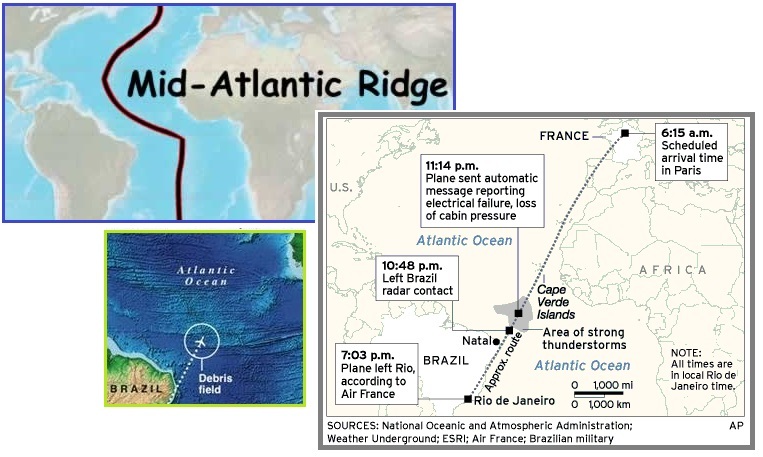 Back in 2009, when the first dramatic incidence of a large plane going down due to EMP, sending multiple signals that it was losing its electronics one by one as it passed over the highly magnetized Atlantic Rift, was likewise an A320. 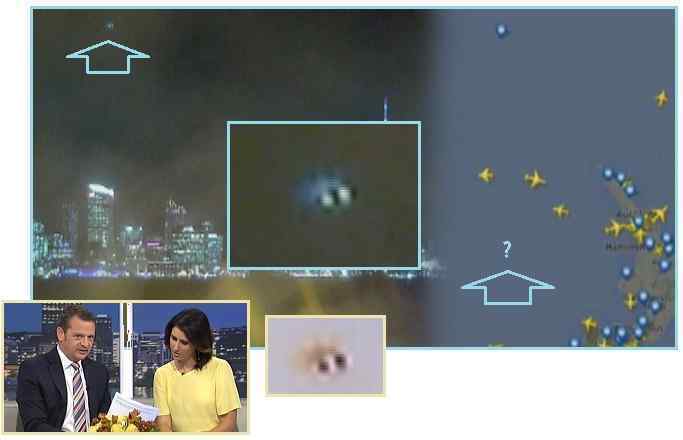 A UFO hit the news in New Zealand, not only because it was captured in a weather camera but because it appeared on a flight tracker moving at speeds that an airliner could not attain. It zipped from New Zealand to the coast of Australia in a minute. But how could it appear in a flight tracker system without a transponder imbedded in the UFO? 'What is it? A plane?' – Has the Breakfast Crew Uncovered a UFO? Have a web-cam and flight tracker programme conspired to reveal the unexplainable? Per the New Zealand newscaster, the call sign for the rapidly moving “plane” was “zed kgdg”. This is not a legitimate plane, but if typed into a search engine it comes up with an interesting result – a map image on a secure website https://starbase.jpl.nasa.gov/mgn-v-rdrs-5-midr-c2-v1.0/mg_0004/f20n351/ff39.img. Is this the call sign for a star system? I first tried “zkgdg” then listened again and he says “zed kgdg” which brings up only the thing below. 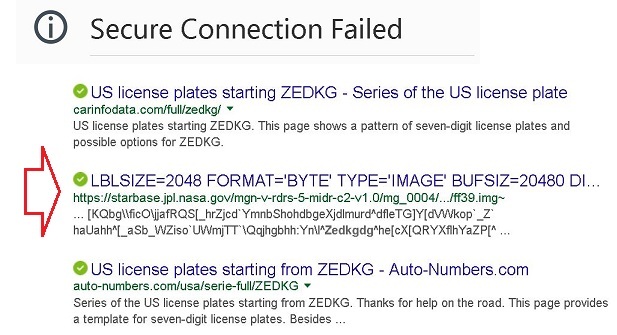 “Zedkgdg” with no space comes up with starbase.jpl.nasa.gov. ZetaTalk Comment 5/21/2016: What is unique about this UFO sighting is that it included the gamut of authenticity. It was seen naked eye. It was captured on camera. It was reported in the news. But most significantly, the UFO registered on an airplane tracking system. These airline tracking systems key off signaling devices built into the airplanes, else they would try to track large birds or even dense clouds. The UFO in question, with the goal of promoting disclosure on the alien presence, simulated one of these signaling devices. Thus in the system, the UFO moved far more rapidly than a human airplane could ever move, as was noted by the talking heads on TV.